Orson Welles was a vain human being but he was not a vain movie star. A character actor at heart, Welles always gravitated to the grotesque. He loved to play fatally flawed individuals, the more makeup the better. 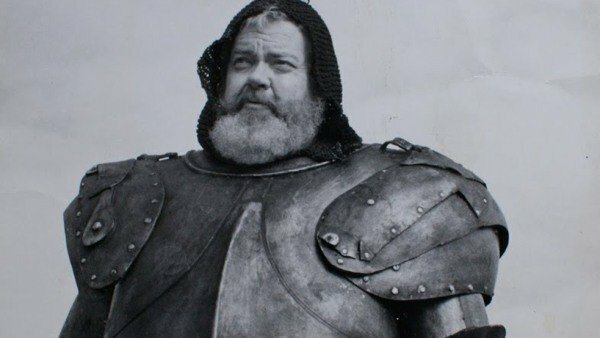 Nowhere is this predilection more pronounced than in Welles’s closest analog to a vanity project, the Shakespeare amalgam Chimes at Midnight, which borrows from five different plays to build a portrait of the corpulent, drunken, “sanguine coward” John Falstaff. This Thursday, Orson Welles’s most-underseen masterpiece Chimes at Midnight is coming to the Scarecrow Video Screening Lounge. Welles, of course had a legendarily messy filmmaking career, one that can be reasonably-evenly divided between his studio films and his independent productions. The studio films are the most famous, featuring also the former consensus all-time #1 Citizen Kane, the butchered masterpiece The Magnificent Ambersons and the too-twisted-for-Hollywood noirs The Lady from Shanghai and Touch of Evil. His independent films include the dishonest documentary F for Fake, the schizophrenic and multiform funhouse Kane Mr. Arkadin, an adaptation of Kafka’s The Trial (which Welles quite rightly notes is a comedy) and three Shakespeare films: Macbeth, Othello and the greatest of them all, Chimes at Midnight, in which Welles combines parts of the two Henry IV plays with bits from Henry V to tell one story about the fat, blustery rogue Sir John Falstaff.